2) including a “Take 5!” mini-lesson with every poem in their collection for librarians, teachers, and parents with instructions for sharing, picture book pairings, and curriculum connections. And in their NEW collection Janet and Sylvia have added another bonus: each of the 156 poems in this newest book appears in both English and Spanish--WOWEE! JoAnn's recent post sang out about this book (which includes JoAnn's terrific Graduation Day poem), and Esther's post continued, including an interview of these two visionaries and Esther's very green Saint Pat's Day poem. I’m thrilled to be one of 115 poets (and 3 Teaching Authors!) 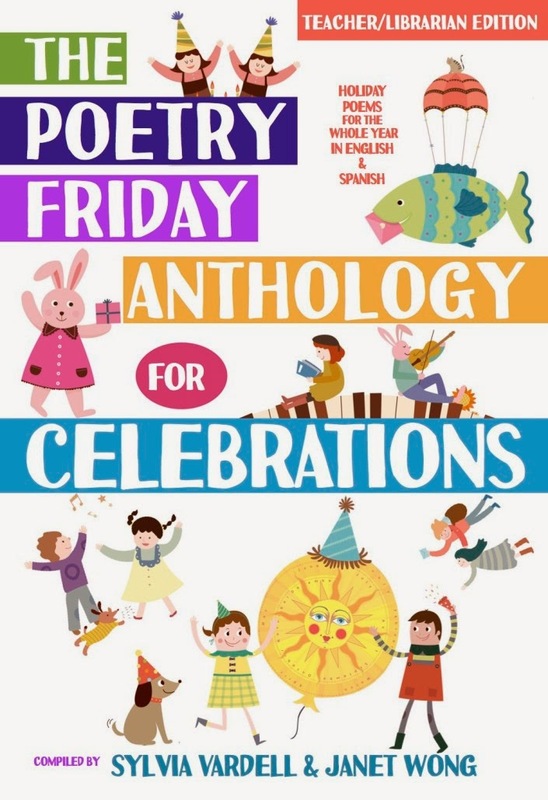 whose poems are featured in the brand-new Poetry Friday Anthology for Celebrations! Remember to enter our Book Giveaway to win an autographed copy of Paul Janeczko’s 50th book, DEATH OF A HAT, illustrated by Chris Raschka. You can enter between now and April 22 (which just happens to be our SIXTH TeachingAuthors Blogiversary!). And...please stop by my poetry blog where all Poetry Month long I'm posting PPPs--Previously Published Poems--from anthologies, Cricket Magazine and my novel in poems. Thank you, dear Robyn Hood Black for hosting PF today! And thanks, too, to Jama Kim Rattigan for posting the 2015 National Poetry Month Kidlitosphere Events Roundup. Dear Monkey and Eli: Thanks so much for your help with this TERRIFIC post! I do shop at Thrift Shops, love the poem too. I didn't know there was a "day" for them. The anthology has days for everyone, doesn't it? Thanks, April! Excellent post! I love Linda's comment. I LOVE shopping for old clothes in thrift shops. Treasures to be discovered. Love the poem. Thanks so much for including us in your lovely Poetry Friday party today-- and especially for your beautiful and thrifty poem! Phew! I'm glad the bear wasn't donated to the thrift shop after all. :) Your poem reminds me of when I attended a yard sale years ago. There were a couple of bears on the table and I convinced the seller to keep them. The new PF anthology is the bomb, isn't it? Don't know how Sylvia and Janet do it -- they must be champion multi-taskers. Love seeing Monkey and Eli again. April, your Thrift Shop poem hits just the right tone. I'm sure we've all met "all or nothing" kids– ones who don't want to part with anything until they discover how good it feels and then want to give away everything! Hmm. We may have to do a National Thrift Shop Day poem for the month on clothing poems, April. Care to revisit that thrift store with some wearable donations? Janet ~ You're very welcome. Linda ~ Yes, it does! Robyn C ~ Monkey: I've made many friends saved from thrift shop baskets. Eli: I've chewed up many of Monkey's friends. Sylvia ~ You're very welcome. Jama ~ Monkey: Can Bear come over and play? Eli: I'd like Bear to come over, too. For lunch. Michelle: Monkey: April says to tell you it was when Hurricane Katrina hit that she reached into her closet and gave away even the things she STILL LOVED. That was the toughest and the most rewarding give-away for her by far. Laura ~ Eli: April says: you still have room for another clothing poem? Always have loved thrift stores. This new anthology is cleverly celebrated here April. It's gre8t that so many of the Teaching Author's are in this cool collection of celebrations. And such a fun twist on the your thrift shop poem, April. Appreciations for the links & the photo of Monkey (who is not going to be recycled at a store) & Eli. I feel so fortunate that so many of my writing pals (in person or online pals) are represented in the new Pomelo Books anthology & it's great to see the mentioned here, including Robyn Hood Black. Robyn: Yes, yes--Jama's comment won Monkey's heart! 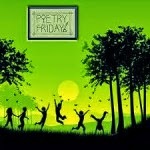 Jan:Yes, it's wonderful to see the poems from so many PF friends.May Texas school districts (and others!) purchase them in large numbers; Pomelo Books deserves a wide audience.